Hurricane Party?!? and Healthy Energy Bars | Who Are You Calling Crafty? So that was how I spent my time in 2004 getting drunk, playing Monopoly with my cat (I am pretty sure she won – lol) and co-workers. My how times have changed, I am now a mom of two kids, even though the thought of evacuating for a Hurricane makes my eye twitch I would do it in a heart beat (Category 3 or higher – a 1 or 2 I am heading to the downtown apartment). Now I sit here and type – what my game plan is (or will be) and it does not involve copious amounts of alcohol it is an actual plan. Today I plan on getting batteries (AA batteries – our Weather Radio takes 4) and basic food/water for 3 days, pack up photos and make sure important documents are ready to go. Start packing some basic stuff for the kids and print out directions to my cousin’s house. We are currently expected to get Tropical Storm Winds which since our roof is “limping” (but soon to be fixed) we are cautiously optimistic that it will hold. I am hoping for a nice Easterly Push (even further than it already has) so we won’t even get Tropical Storm Force anything. 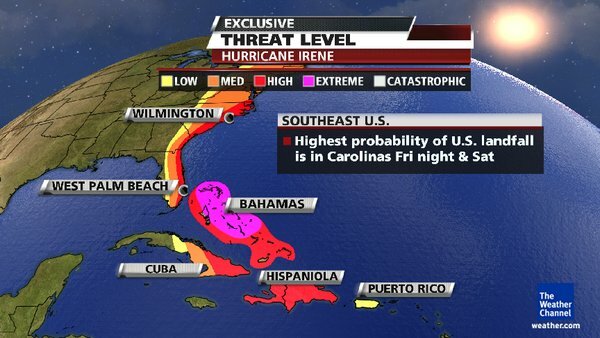 Reading the reports I just read Irene could be a 4 when it passes 150 miles to the East of our shore that does NOT make me all warm and fuzzy! I am thinking of baking Energy Bars today because what screams Hurricane more than Energy Bars? I know I am going to need all the energy I can get. This is one of my favorite recipes, hope you like it! Heat Oven to 275. Lightly grease 9″ baking pan with oil. Grind almonds in a food processor until they resemble a coarse meal. Combine the ground almonds and the remaining ingredients in large bowl and stir well. Using wet fingers, press the mixture into the prepared pan and bake it for 1 hour. Allow the bars to cool thoroughly while they are still in the pan, then slice them. Makes 20. You are truly blessed to be living in Savannah, the South's most enchanting city. 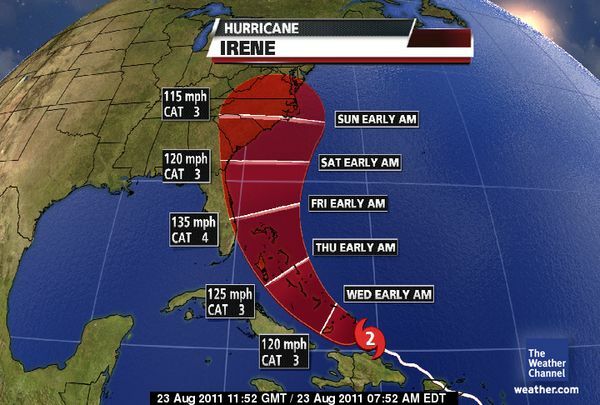 Fingers are crossed that Irene does not come crashing through Savannah.